KINGSTON, R.I. – Junior guard Tony Taylor swore Wednesday night that he wasn’t thinking about Temple when he took the floor against Rhode Island. He wasn’t thinking about his team’s 57-41 loss to the Owls last Saturday, and he wasn’t thinking about the five points he’d scored against them. He said he didn’t have anything to prove Wednesday night in the men’s basketball team’s road game at Rhode Island, but if Taylor had any doubters, he made sure he answered them, scoring 23 points in an impressive 66-55 Colonials win over the Rams. “I think I put [the Temple] game behind me. That was not a token game for me and I think I put too much pressure on myself to try to do well. I wanted everything to go right, and everything went wrong, so I just came out today and took it like any other day,” Taylor said. “I want to prove that everybody sees I’m an all-conference player and I want to do whatever it takes to make this basketball team win,” he added. Taylor, GW’s leading scorer this season, was at his best Wednesday night, hitting jumpers, making layups and getting to the free throw line against the Rams. 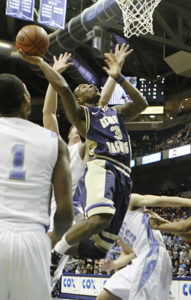 The only hole in Taylor’s game against Rhode Island came from beyond the three-point line, where he was 0 for 5. Take away those misses, and Taylor was 9 of 10 from the field, a nearly perfect night. After struggling to control the pace of the game against Temple, GW controlled the tempo of Wednesday night’s game, thanks largely to a stout Colonials defense that forced the Rams into 17 turnovers. “When we get a stop and get these fast breaks, it’s allowing us to shoot better and it’s allowing us to get more open shots and more high-percentage shots, and that’s what our offense is predicated on, our defense,” Taylor said. The Colonials defense limited Rhode Island leading scorer Delroy James to 12 points, five less than his season average, and kept the Rams from going on any extended runs, something Hobbs said was critical in his team’s victory. By pushing the pace, GW also managed to keep the Rams from setting up their half-court offense, where Hobbs said Rhode Island was particularly dangerous. The Colonials also benefited from senior center Jabari Edwards, who came off the bench but played 25 minutes, more than any other GW big man, against the Rams. Edwards grabbed a team-high eight rebounds and scored six points, and Hobbs said his emergence as a major-minutes player for the Colonials has given GW a defensive presence in the middle that it lacked earlier in the season. With the win against the Rams, the Colonials clinched a home game in the opening round of the Atlantic 10 Tournament next Tuesday night at the Smith Center. Which seed the Colonials will end up with and who they will face in that game Tuesday won’t be decided until the final conference games wrap up Saturday, but Hobbs said there are still goals his team wants to reach before entering postseason play. It’s a nice change of pace, Taylor said, from his previous two seasons in Foggy Bottom, when the beginning of March brought a very different set of stressors for the Colonials. GW will wrap up its regular season Saturday with a senior day match-up against Dayton with tip-off set for 2 p.m. It’s a game Taylor said will give him and his teammates a chance to put on a show for the fans they disappointed against Temple.